Do you have a book inside you that’s dying to get out? Do you feel intimidated or overwhelmed about starting to write? Are you completely lost about how to even go about it? With the proliferation of publishing options in this digital world, many people are finding themselves compelled to write a book. Those who want to pursue a professional speaking career are finding that having a published book is essential. But the process can be daunting. After completing this course, you will have the knowledge and confidence to begin your book and see it through to publication. Don’t wait – start now and experience the exhilaration of holding your published book in your hand! Click here to see a sample workbook page. Upon receipt of payment, you will be taken to a page to download the components. NEW EDITION NOW AVAILABLE ! ! ! 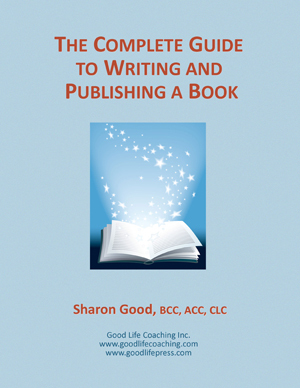 In this resourceful e-book, veteran small press and self-publisher Sharon Good shares the steps to starting your own small press and publishing your first book. If you're planning to publish with an Internet publisher, this book will help you understand the process and the questions to ask to have the best publishing experience. SECTION 1: WHO SHOULD SELF PUBLISH? Find out if you're a good candidate for self-publishing, as well as the pros and cons. Learn the steps you'll need to take to start a small press. Learn what goes into publishing a book and the terminology you'll need to know to communicate effectively with your printer or Internet publisher. Learn how to work with Internet "print-on-demand" publishers and to produce your own e-books. Plus lots of resources with live links to their Internet sites.